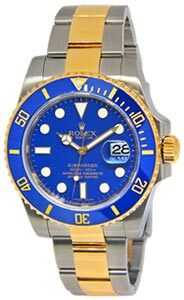 New mens Rolex Submariner Date (ref. 116613LN; random serial number with card dated 2012) in 18k yellow gold and stainless steel features the latest ceramic bezel. Plastic clad and unworn with Rolex card and box as shown. Retail $13,400.